I love this quote and I'm really trying to embrace who I am as I'm on this journey called life... I feel incredibly satisfied and very ME, when I'm up to my elbows in inky goodness, as I was making the cards I'm sharing this week. I can only imagine how giddy I will be this weekend at Ranger University! By the time this post is live, I'll be in the air on the first leg of my journey... I can't wait to share with all of you what I learn there! This card has very similar elements to the one I shared on Saturday, namely those delicious canvas resist butterflies inked with Distress Stains- greens & blues this time. I've added a metal embellishment, ribbon and bling from my stash and did some layering with Vintage Dot paper by BoBunny. Love this stuff- it coordinates so perfectly with their collections! I've used Deconstructed Sketch 48 as a starting point for my card :) Hope I'll get at a computer so I can enter my link before it's too late! 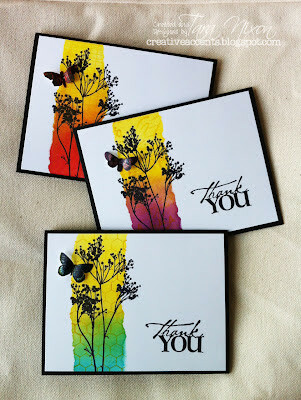 Again, this card is perfect for our Sprays & Stains Challenge at the SCCB (getting tired of typing the whole thing out!). Won't you join us? One random entrant will win a $10 gift certificate for our online store, which is coming soon! That IS a great quote, is it a stamp? 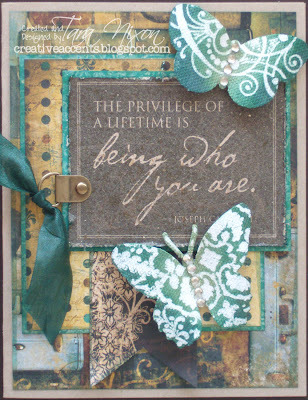 I absolutely LOVE the colours you've used here, so gorgeous, and those butterflies, WOW!!! You've inspired me to break out my Prima canvas, only used a couple pieces from the pack. Have a fabulous trip, hugs, Roxy.